The horror genre is practically non-existent when it comes to translated visual novels so I was pretty keen to give the recently released Sound of Drop a go. It looked like it had a pretty high quality of production and some fairly gory scenes, which are right up my alley. Unfortunately, I have to say that Sound of Drop doesn’t deliver on its promise of horror beyond its (admittedly numerous) relatively brief bad ends and winds up being decidedly bland overall given its short length. When her best friend Himeno suggests a trip to Manten Aquarium, Mayumi Nakanobe is less than enthused. Beyond the rumors of visitors going missing and the fish tanks mysteriously filling with blood, Mayu has her own history with the place. Five years ago her younger sister went missing during their own visit and she was never seen again…her parents don’t talk about it anymore. But she can’t turn Himeno down and the two are soon separated within the Aquarium. With no one else around and danger lurking behind every door, Mayu wonders whether they will ever be able to escape alive. You may or may not have read them, but Sound of Drop feels a lot like a watered-down version (no pun intended, I swear!) of the old Goosebumps books I read as a child (without the grotesque images, I suppose) in that it’s short, lacks any sort of character development and, from a horror perspective, there just isn’t much going on (which is the watered-down part). Mayu travels from room to room encountering things that are dangerous, sure, but that never manage to cultivate the tense atmosphere you might expect from the genre. 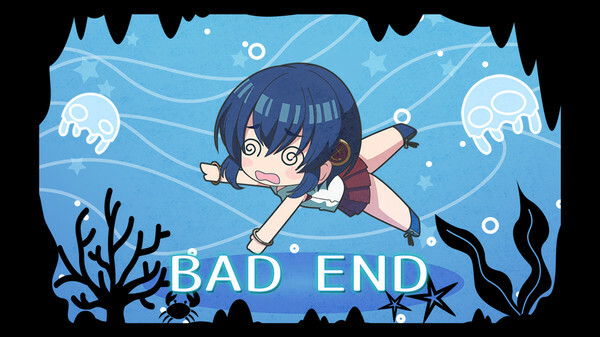 The large number of bad endings actually hampers the novel’s ability to do that because when you always know that one choice is going to lead to death (and there’s often no way to tell which one) the story loses any chance it might have had of doing something unexpected. This is not helped by the fact that every decision with a potentially fatal result is helpfully highlighted in red. While the bad ends are suitably gruesome they are too brief to really impact on the reader’s feeling of terror without any accompanying atmosphere of dread. If you had thought that the day might be saved by the accompanying narrative, you would be wrong. At approximately two hours to complete a True Route, there’s no time to establish anything for the audience to care about. Even without taking the horror aspect into account I can’t say that Sound of Drop’s story accomplishes anything noteworthy. Other characters enter the picture when they’re convenient to the plot in order to move things along but there’s nothing to tie the audience to them because they’re gone five seconds later, and the protagonists in these sorts of novels are almost never interesting to begin with (and Mayumi is no exception). The interactions between characters are also rather contrived and inconsistent, with trivial events evoking emotional outbursts while horrific happenings are recovered from almost instantly. The room-to-room formula I mentioned earlier is the par for all but the final chapter of each route and tends to avoid contributing anything to the plot outside of information dumps near the conclusion of the game which in turn lack the impact they would have needed to redeem the earlier content. Sound of Drop’s visual and audial aspects are its saving grace in that they are both modern and enjoyable. 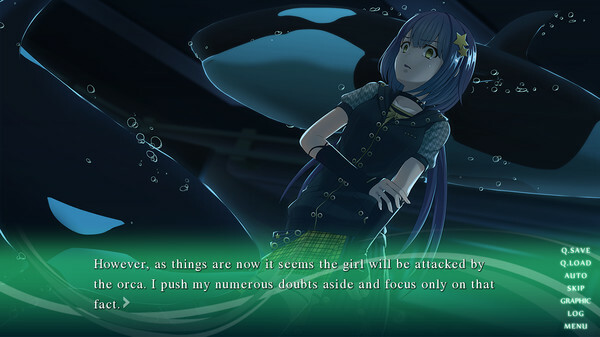 The use of camera techniques and sprite placement makes for a more dynamic reading experience than many other titles and in general the CG and background art also meet a high standard, which is especially important in a setting like an aquarium. The more grotesque imagery would have been able to achieve its goal just fine if the writing had backed it up. Their ability to contribute to the horror aspect aside, the BGM tracks are all very pleasant to listen to and the opening sequence was probably my favorite feature of the entire visual novel. Unfortunately, there’s no voice acting whatsoever which is something I think could have been used to give the experience an extra bit of oomph (for lack of a better term). 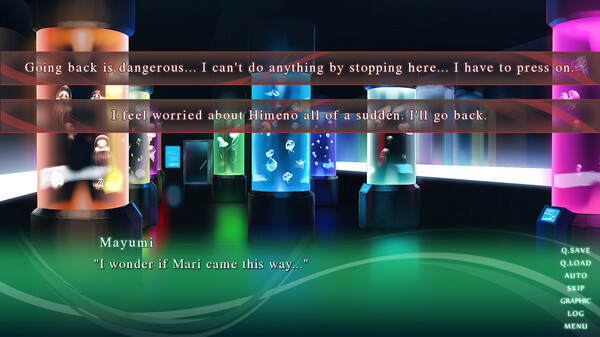 While Sekai Project’s translations are getting better and better there were a number of points where more literal interpretations led to awkward wording considering the age of the individuals involved and the setting they were in, though I wouldn’t say any of them impacted negatively on my reading experience. Summary – I’ve been pretty harsh but I don’t want you to get the wrong idea. 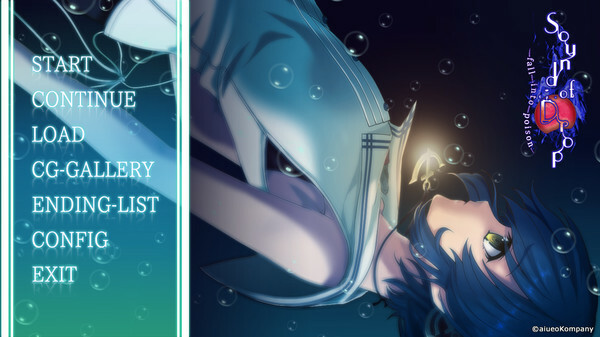 Despite its relative lack of horror atmosphere and shallow characterization Sound of Drop is not a bad visual novel; for the most part the writing is decent, the story flows in a way that makes sense and the technical aspects are well up to scratch. It’s just that over the course of time I spent playing it failed to elicit any kind of emotion from me at all, making it a phenomenally average experience. This entry was posted in Reviews, Visual Novel Reviews and tagged aiueo company, fall into poison, Review, sekai project, shizuku no oto, sound of drop, Visual Novel, VN. Bookmark the permalink. The horror itself is also quite low impact for the most part. Things like exhibits containing poisonous jellyfish breaking open and spreading them all over the place. It would definitely be scary if it happened in real life but it’s not really horror, y’know? So, there are four True Endings to the game, correct? Can you explain those endings to me in a summary and who lives in them? Also, the game is indeed average, in that while there’s horror, it’s not done well. The writing is decent, but it can make you indifferent. Is that right? Yes, there are four True Endings though unfortunately it’s been a very long time since I first read it so I can’t remember what happens in them. I’m particularly bad at remembering story content I didn’t enjoy to begin with. The writing is decent in that if you look at any one sentence or paragraph the grammar is correct and the words themselves flow well. However, on a larger scale the overarching plot, individual events and characters aren’t particularly interesting. The narrative didn’t manage to cultivate the kind of atmosphere a horror story needs to suspend your disbelief and make you feel involved in the danger. The only horror VN i’ve found that managed that to any degree is Phenomeno, though that’s very short. Huh, interesting. What was the ending to Phenomeno? I believe the mystery was solved with no deaths? I mean, Yamada and the others are still alive, aren’t they? More or less. It’s not really a complete ending because the entire VN was created as a advertisement for the light novel.